According to Islamic Eschatology (the study of the End Times) there is a Prophecy that the Horns of Satan would appear from the region known as the Najd which is Modern Day Saudi Arabia. So the Machiavellian Machinations we are seeing today by the #ChainSawReformer aka #MbS is part of an Ancient Timeline that is now playing out in our Present Day Reality which we refer to the #FatimaTimeline. Nothing with the World of the End Times and the Occult happens by Accident. These events are all part of Predestined Plan and are happening with Intent and by Design. So we should not be surprised by these Events. What we should be Shocked by is the Level of Apathy and Fear and Acceptance of such Crimes and Criminality by their so-called Leaders. The Man is behind the War on Syria and the War of Yemen as ironically mentioned in the same Hadith is the same Person who is in our Opinion the Man who will also Usher in the Coming of the Mahdi. Destroy of the Religion (by dividing the Shia and Sunni). Destroy his own Family the House of Saud (of Saudi Arabia which is literally and Family Run Mafia masquerading as a legitimate Nation State). Destroy the Lands of Sham (Syria as mentioned in the above Prophecy). Destroy the Yemen (also mentioned in the above Prophecy). Lose Control over the Holy Cities of Mecca and Medina as they are turned into City States of Old. Make a Historical Peace Deal with the Zionist State of Israel (and thereby confirming the End Times Alliance between Gog and Magog and Lose his Religion). This agreement has been drafted and decided already and is just waiting to be implemented at the right time. And now as a diversion from the disastrous Jamal Khashoggi affair. 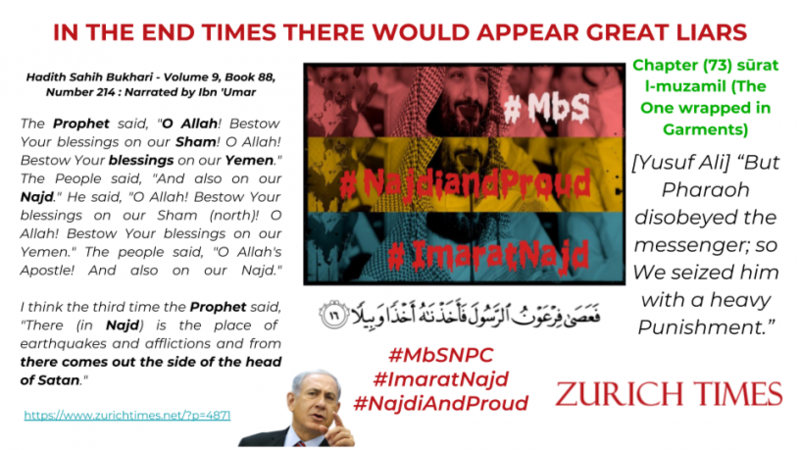 Recreate and Emirate of Najd or the Imarat Najd. And in this reference the Jamal Khashoggi affair is also not happening by Accident, but with Deep Symbolism for those who have Eyes to See and Ears to Hear. We were truly shocked to learn that how closely History was Repeating itself in this Jamal Khashoggi affair. For this History Lesson we have to go back 200 years to 1818 from 2018. Just as 1918 was the year that saw the end of the Ottoman Empire so too did 1818 Mark the End of the first Saudi State (Emirate of Diriyah) and now in our Opinion so too as an End Times Marker in 2018 we are seeing the Death of another Kingdom as in the Kingdom of Saudi Arabia with the Death and Beheading of Jamal Khashoggi. [Wikipedia] The Arab Revolt began in 1916 and turned the tide against the Ottomans on the Middle Eastern front, where they seemed to have the upper hand during the first two years of the war. The Armistice of Mudros was signed on 30 October 1918, setting the partition of the Ottoman Empire under the terms of the Treaty of Sèvres. This treaty, as designed in the conference of London, allowed the Sultan to retain his position and title. The occupation of Constantinople [Istanbul] and İzmir led to the establishment of a Turkish national movement, which won the Turkish War of Independence (1919–23) under the leadership of Mustafa Kemal (later given the surname “Atatürk“). The sultanate was abolished on 1 November 1922, and the last sultan, Mehmed VI (reigned 1918–22), left the country on 17 November 1922. The caliphate was abolished on 3 March 1924. Now going back further to 1818 we find that the Decline of Sovereignty of the first Saudi State called the Emirate of Diriyah ends with another Death and Beheading. [Wikipedia] The task of weakening the grip of the House of Saud was given to the powerful viceroy of Egypt, Muhammad Ali Pasha, by the Ottomans. This initiated the Ottoman–Saudi War, in which Muhammad Ali sent his troops to the Hejaz region by sea. His son, Ibrahim Pasha, then led Ottoman forces into the heart of Nejd, capturing town after town. Saud’s successor, his son Abdullah bin Saud, was unable to prevent the recapture of the region. Finally, Ibrahim reached the Saudi capital at Diriyah and placed it under siege for several months until it surrendered in the winter of 1818. Ibrahim then shipped off many members of the clans of Al Saud and Muhammed Ibn Abd Al Wahhab to Egypt and the Ottoman capital, Istanbul. Abdullah bin Saud was later executed in the Ottoman capital Istanbul with his severed head later thrown into the waters of the Bosphorus, marking the end of what was known as the First Saudi State. However, both the Wahhabi sect and the remaining members of the Al Saud clan stayed committed to found a Second Saudi State that lasted until 1891, and later a third state, Saudi Arabia, which continues to rule till the present day. Are we still lost or are we now finally seeing the significance of this End Times Beheading in October 2018 the Month of Safar (month of Calamities) in the Year 1440 in the Ancient Capital of Constantine aka Constantinople aka Modern Day Istanbul with the same Actors Turkey and Saudi Arabia battling over Sovereignty in the Consulate with exactly 18 Suspects that are wanted for the Crime? Only the Creator could recreate such a Story. Period. All these points are detailed and spoken about in these videos and links. Without following the evidence all the way through and just skimming will not work as we are now in the End Stage of the End Times. An evidence based discussion using Muslim sources and Muslims Prophecies. No Boxing Gloves here. So please do not accuse us of being Biased. The Modern Day Dogs of Hell aka the Khawarij.